Dollamur mats are among the highest grade gym and exercise mats you can buy. Their biggest customers are studios and gyms for commercial use. If you want to buy something at the next step beyond Manduka mats, consider the Dollamur mats. 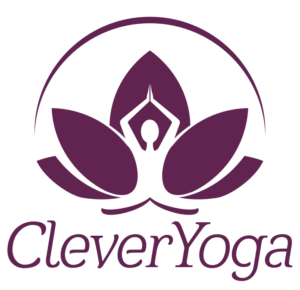 Or if you want to set up the best home yoga studio that money can buy, you should read this review. Be warned, professional-grade Dollamur mats aren’t cheap! Dollamur mats come in several varieties that are suitable for yoga. We’ll go over portable Dollamur mats for carrying to class and larger home gym flooring options. The Ultimate Core Fitness Mat (Amazon link) by Dollamur is the closest Dollamur mat that is similar to a regular yoga mat. 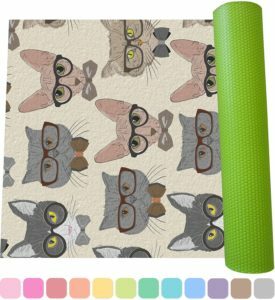 At 36″ x by 72″, this mat is extra large and a great yoga mat for men or taller women. The vinyl surface has an anti-microbial coating for easy cleaning and maintenance. 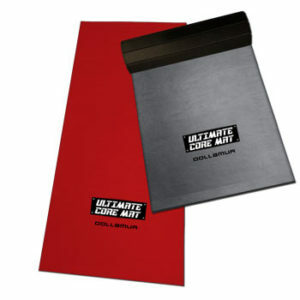 The Ultimate Core Fitness mat is 5/8″ or 16mm thick, which is thicker than what we normally recommend for a yoga mat. (See our article on thick yoga mats for an explanation about why too thick is usually bad.) However, in the case of the Dollamur mat, you need to consider the different class of mat material. Dollamur mats use commercial-grade sports foam, which provides greater resistance and stability compared to cheaper “mushier” foams. Even though the Dollamur mat is thicker than what is usually appropriate for a yoga mat, it works fine for yoga. This mat is surprisingly portable despite its large size, weighing only 4 pounds. 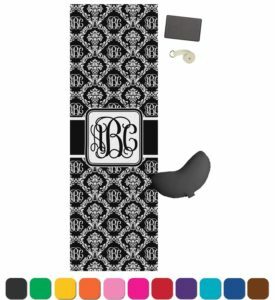 It’s easy to roll up and carry or store as you desire. Compare to the natural rubber mats, where a typical large 6mm thick rubber mat might weigh 10 pounds. The surface grip is suitable for ordinary yoga and on par with the Manduka PRO mat or similar premium yoga mats. We wouldn’t recommend the Dollamur mat for hot yoga, unless you were at least using a yoga towel in combination. Dollamur also makes a textured tatami-style mat (Amazon link), which has a better grip, but this mat is much too large and heavy to carry around. Now let’s look at the price. You need to check Amazon for the latest pricing with the link above, but the Dollamur mat typically costs about twice as much as the Manduka mats. You are getting a 3 feet wide mat, and this mat is suitable for general exercise such as pilates, calisthenics, P90x, or similar programs, in addition to yoga. 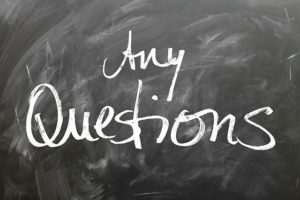 Most mats are not good for multiple exercise types, as they will be too thick for yoga or too thin for the other tumbling or ground-based routines. If you want an all-around large but reasonably portable mat for yoga and other exercises, the Ultimate Core Fitness Mat from Dollamur is a premium choice. If you want the absolute best home gym mat flooring for yoga and other exercises, Dollamur mats are the number one brand. You will, however, pay for that privilege. The Dollamur Foam Flooring (Amazon link) is a premium home gym flooring foam that comes in a 6 feet by 42 feet roll for a 4-figure price! This is the same type of flooring used in serious gymnastics competitions. The bottom foam layer is bonded to an upper gymnastics carpet. Dollamur’s punch needle carpet provides durability and exceptional grip even during sweaty conditions. The whole mat is 1 and 3/8 inches thick, or 35 mm. 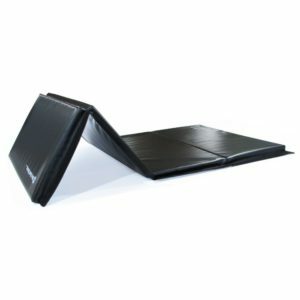 Clearly, this is much thicker than a traditional yoga mat. However, gymnasts routinely perform handstands or other yoga-like poses, and the floor mat does not pose a problem for stability. Again, this is because you have high quality sports foam and competition-grade carpeting on top. 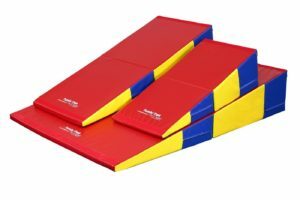 Slipping is exceedingly dangerous during a rapid gymnastics routine, so you know that this material can perform under the most demanding conditions. Dollamur mats are designed to connect with each other, so you can lay down multiple rolls side by side if you need to cover the entire floor. If you are thinking about the ultimate home gym for yoga, tumbling, and other exercises, Dollamur’s foam flooring is an option if you can afford it. 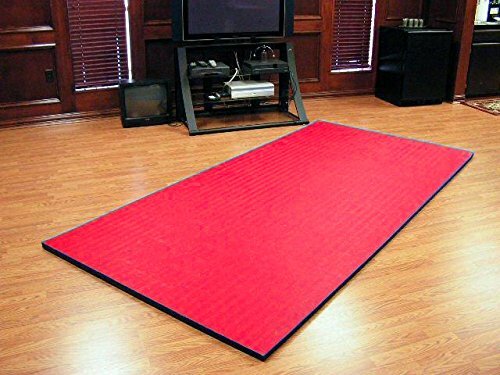 Dollamur also sells a smaller 5 feet by 10 feet version (Amazon link) of the carpeted gymnastics mat for about a tenth of the price. Dollamur mats are an interesting alternative yoga mat for personal or home gym use. You get the same quality of flooring or mat as a commercial grade gym, but you also have to pay commercial prices. 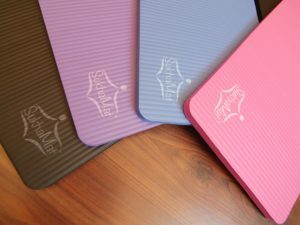 Most people probably prefer a standard yoga mat, but Dollamur mats are great for cross-trainers or exercise enthusiasts.